The buying process for talent management solutions can begin by identifying shortages of existing means. Buyers should start by considering the elements of talent management systems that will suit the needs of their business. Learning management tools help foster educational growth and the development of a skilled workforce. Accessible training modules provide classes on a number of professional development subjects, ensuring new employees are properly prepared and current team members have equivalent skill sets. Inside promotion is facilitated by educating employees on the necessary knowledge to fulfill a new role. Recruiting and applicant tracking software automates the task of reaching out to potential employees. These tools handle communication with incoming professionals over different channels. Recruiting and applicant tracking software keeps candidates informed during the hiring process while managing responses, interviews and offers. The systems also provide feedback on talent to streamline elimination and promotion. Performance management software monitors the advancement of employees during their time at a company. These types of tools assist with regular review processes and the ongoing monitoring of an employee’s performance. Performance management software enables better assessment of staff productivity and talent. 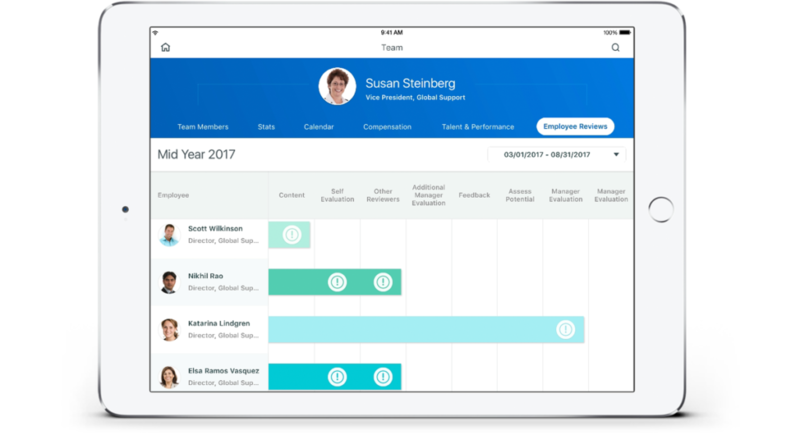 A performance management interface from Workday. Competency management software helps company leadership assess, score and rank the achievements of employees. These tools help with surveys, tests, certifications and other competency measures. Some systems focus on learning events such as seminars, workshops, webinars and workplace curriculum. Others aim at specific digital review processes for technical competency. Career management software brings more of a broad approach to how companies handle employee information. These tools allow employees to access information about their careers. Leadership can use career management software to document processes and monitor employee development. This set of software products consider pay, expenses, per diems, incentive models, stocks, bonuses and commissions. Compensation management software can be used as a tool to set compensation and monitor effects and changes. Information derived from compensation management software can guide future financial decisions. Vacancy of a role requires quick, yet careful, decision making. Succession planning and management software is a critical part of the replacement process. 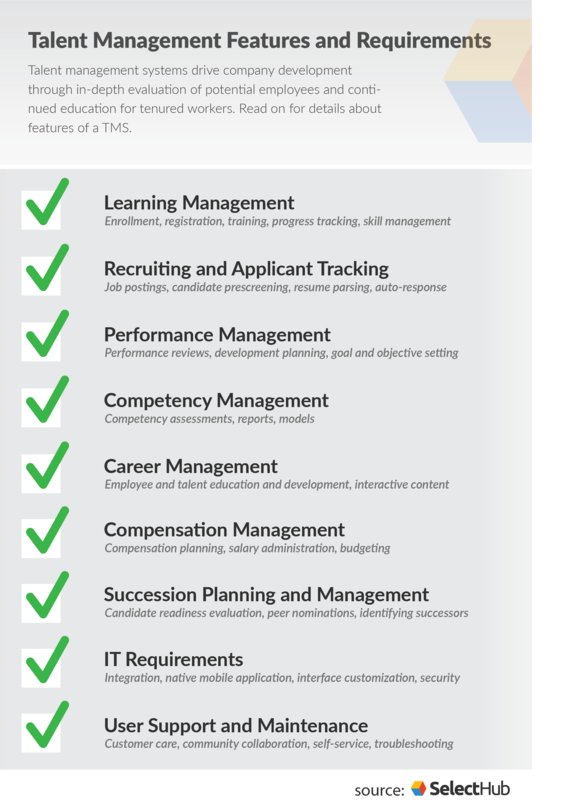 These tools help automate and improve talent management. The right toolset will fit existing IT architecture for seamless integration. Factors such as deployment methods, mobile capabilities, security requirements and existing company programs can influence a business’s choice in talent management software. A system should be able to work with the applications frequently used by a company. Adding the benefits of new talent management systems without disturbing infrastructure should be a main goal of implementation. Finally, customers must look at the support processes that companies offer for talent management software sets. This includes customer service and community support networks. The ability to report issues and see quick solutions ensures a user-friendly experience. Service level agreements provide information on maintenance and the availability of services. Evaluating the features of talent management software necessitates careful consideration of an HR department’s current capabilities and points of weakness. HR managers can think about features in the scope of how they will present direct benefit. An awareness of need can lead to the identification of requirements and, eventually, vendors, that will provide a solution.